Red Bull were looking for their first victory in Canada, and with Sebastian Vettel starting from pole position, they made the best possible start they could. Surprisingly, for a race in Montreal, there were no safety car periods, and only a couple of retirements throughout the afternoon. There were some good fights between the top drivers, and a couple of intriguing strategy calls that put a lot of pressure on the drivers trying to complete them. If you missed any of the action, or want to relive the fun and games from Canada, here's a lap by lap replay from the Factbyte Factbox of Sunday afternoon in Montreal. Hello there! Welcome to the Factbyte Factbox for the Canadian Grand Prix, it's shaping up to be a good one! So far this weekend, we've had changeable conditions in the sessions, seen the full range of tyres in action (including development ones), a few grid penalties enforced, and a couple of great surprises in qualifying. And with just an hour to go until the race begins, the weather is one of the hot topics of the moment. There were blue skies in evidence earlier this morning, but so far it looks as though the clouds have been moving in over the circuit, and looking a bit threatening on occasion. The weather affected qualifying and the majority of the sessions were run on intermediate tyres. Although Sebastian Vettel took pole position, Valtteri Bottas was the major headliner - snatching third in the Williams. He's also promised to jump in the lake if he gets his first point this weekend. I don't know about anyone else, but I'd quite like to see that. There were two unusual penalties handed out to Kimi Räikkönen and Daniel Ricciardo, after a restart in Q2 saw them lining up in a third queue at the end of the pit exit. The pair were handed two place drops each. A pretty bad day for Lotus, with Kimi starting from tenth, and Romain Grosjean all the way at the back of the grid (poor qualifying, plus ten place grid drop from Monaco). Assuming it stays dry today, we'll see the medium (white) and supersoft (red) compounds in action today. If it rains, there'll be some intermediates with green sidewalls and/or full wets in blue. Tweet from @GvanderGarde: Finished driver parade.. Now i get changed, and get ready for the race.. Enjoy it guys. I am looking forward to it!! DRS is slightly unusual this weekend, with one detection point and two activation points. The detection comes just before the hairpin, with the first activation down the following straight. The second comes after the final chicane and down the home straight. The other story to keep an eye on from qualifying is Adrian Sutil, starting in the top ten. It's Force India's 100th race this weekend, so they're looking for a good result. Unfortunately for Paul di Resta, he was out in Q1 for the second race weekend in a row, so he's probably in for a difficult afternoon. Felipe Massa crashed out in qualifying, so he's also going to have a task on his hand to retrieve a good result in Canada. Tweet from @OfficialSF1Team: dry conditions for the race. a possibility of rain around 15:00, but most probably it stays as it is. we expect to see 1 and 2 stoppers. The pit lane is open, so engines are firing up and the drivers are starting to make their way towards the grid. The historical evidence would point you in the direction of either Lewis Hamilton or McLaren. Unfortunately, neither have had the race pace to be supremely confident of victory today! Interview with Adrian Sutil: "Finally, we had enough rain. Looking forward to the race, clear conditions I think. Let's see how it goes. The car is fast, so I look to the front. 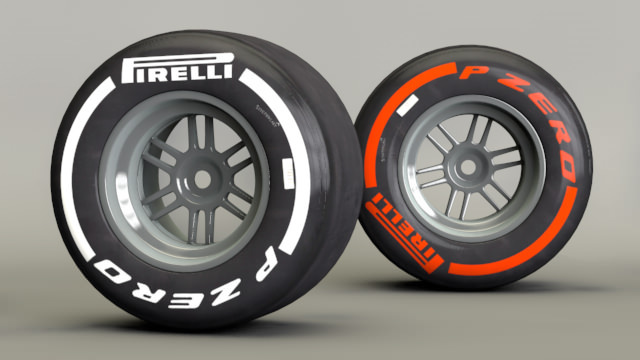 The tyres are quite good... the medium is a very strong race tyre. I think here passing is definitely possible, also without DRS we've seen it in the past, so it should be a good race." Interview with Nico Hülkenberg: "Profited from the penalties for Ricciardo and Kimi. P9 is not a bad spot. It's a bit of a surprise today what will happen with the tyres, a bit of a mess with the weather and the tyre data. But I'll be open-minded, go out there and see what strategy we have to use... I'll just try hard, hopefully we're quick enough on the straights. I love racing here, so hopefully we'll have a good race." I missed a lot of Webber's thoughts on the grid due to some of those ambient motorsport noises, but he said he's going to try and clear Bottas early. The national anthem plays out, and there appears to be a grand piano being played on track, just in front of the start line. There are lovely blue skies overhead now, lots of clouds still around, but they're looking more white than grey. Alan Permane isn't looking too confident on the grid, he says whichever way they go with race strategy, their projections are that Vettel disappears off into the distance. Tweet from @radarguruf1: #F1 radar update T-8: Showers have developed to the east of Montreal but nothing over the circuit - yet. It's dry and sunny. Track temp 28c. Drivers getting settled in their cars now, just about three minutes left to the formation lap. Several of the drivers have umbrellas being held over their heads, but that's for the sun rather than any precipitation. The tyre blankets come off, and the grid clears of mechanics. Sebastian Vettel leads the pack away on the formation lap. Most of the drivers have opted for the supersoft tyres to start with. Di Resta, Bianchi, Chilton and Grosjean are starting on mediums, from 17th, 19th, 20th and 22nd place respectively. It looks like Grosjean is out on track, not starting from the pit lane which he could have done. Vettel pulls to a halt at his pole grid slot, and the rest of the cars file in behind. Clean start off the line, Vettel sweeps off around the first corner. Webber looks like he's passing Bottas around turn three. Webber did say he was going to try and get round the Williams as quick as possible. Fernando Alonso is next in line to get past that Williams, he pulls alongside, but Bottas comes back at him at the next chicane. Around the hairpin, Alonso tries to keep his line around the outside, but Bottas remains just ahead. Finally it gets done before the final chicane. Hülkenberg cut the final chicane, unclear if he gained anything from that. Alonso's battling with the Williams have allowed the front four to pull out a bit of a gap, but the Ferrari is charging away from Bottas quickly. Felipe Massa is trying to pass Pastor Maldonado, as he tried to make moves forward after his poor qualifying. Massa makes the move at the final chicane, he's up to 13th place. Grosjean is up to 20th place already, whilst Giedo van der Garde has moved up to 17th already. Vettel has broken the DRS, he's already far enough ahead of Hamilton to be unchallenged. Ricciardo managed to get past Räikkönen off the line, moving up to 9th to the Lotus drivers 10th. Vergne has got round Bottas, and there's a quick looking Sutil chasing him too. Sutil attempted to take the Williams into the chicane at turn three, but lost the back end. The car spun a 360, he barely lost any momentum (although a lot of places) and carried on without barely a thought! Maldonado locked up under braking, hit the back of Sutil, and bits of carbon fibre are flying in all directions! Replays of Sutil's spin show three or four cars taking to the high kerbs to avoid him - there could be some underfloor damage to come! Felipe Massa has overtaken Pérez. Max Chilton is apparently reporting that his brakes aren't working, and we have already seen plumes of brake dust coming off that Marussia earlier in the weekend. One to watch for reliability issues there. Giedo van der Garde has pitted, which puts him right at the back of the field. Paul di Resta has been told on the radio that the supersoft tyres are terrible, and as he started on the mediums, he needs to get past all those in front of him on red tyres to make a race of it. Meanwhile, Adrian Sutil has pitted early. Replays show Sebastian Vettel kissing his rear wheel against one of those pesky chicanes. Felipe Massa is chasing Kimi Räikkönen, who in turn is just behind Ricciardo. Both the Ferrari and the Lotus had their DRS open in the zone, with Kimi defending hard. Adrian Sutil is informed he has damage to the rear wing. He's having a terribly scrappy race here. Kimi zips out past Ricciardo, to make the gap to Massa not only three tenths, but also one whole car. Now Massa has to make the move on the Toro Rosso, he's so close. Ricciardo locked up round the hairpin, but managed to keep the position. He gives up the fight by diving into the pitlane though. Mark Webber has been complaining of no front grip, and he's into the pits for a relatively early stop. Vergne also comes in. Vettel's got his lead up to over seven seconds now, as third place Rosberg comes into the pits. Valtteri Bottas is also in for a change of tyres. The third place grid slot is gradually dropping away! Incident involving Sutil and Maldonado under investigation - causing a collision. Drive through penalty for Maldonado - causing a collision. Sebastian Vettel pits from the lead. Looks like there's no "stopped time" data in the pit lane for the Red Bull team so far this race. It's fair to say they're quite fast though. Felipe Massa puts on some more supersoft tyres in his stop, whereas Alonso opted for the harder tyres. Maldonado takes his drive through penalty, which drops him all the way down to 19th. Lewis Hamilton comes in from the lead of the race, promoting Vettel back into his rightful P1 position. Van der Garde stopped really early, and it's put pay to his quick start off the line. He's still last, despite teammate Pic also having stopped now. Felipe Massa has dispatched Gutiérrez, and Pérez has also made his way past the Sauber driver. Esteban dropping down rapidly. Felipe Massa is charging forward again, he's lined up Adrian Sutil ahead of him. They're side by side up to turn one, but Sutil isn't giving it up. Team radio to Kimi Räikkönen: "Mix one, Kimi. Fuel consumption is higher than expected." The Finn dives into the pitlane for the medium tyres, and it's a slow stop with rear tyre problems too. Problems upon problems for Kimi. Both Sutil and Massa have swept past Jenson Button, so the fight is still on for those two. The best way to enjoy an F1 race, via @timmylit11. Felipe Massa locks up as he's still putting pressure on Sutil. There's a bit of a gap to make up now. Paul di Resta and Romain Grosjean are up to 7th and 8th respectively, as they have yet to come in for a pit stop. They're side by side again, this pair are going at it lap after lap. No crashing yet, I'm super impressed. Button is trying to save his tyres, he hasn't pitted yet, but he's losing positions rapidly. Bottas has made it back past the McLaren now. And there he goes, Button dives into the pit lane for fresh tyres. Meanwhile, up front, Vettel's extended his lead to about 15 seconds. The battle is on between Rosberg, Webber and Alonso, as Webber desperately tries to get past the Mercedes ahead. Rosberg's locking up all over the place, and still Webber can't make the move. It's only a matter of time, though. Meanwhile, Alonso is sitting watching the fight and waiting for the right time to make his move. Webber makes it happen at last, and it takes one more corner for Alonso to sweep past as well. Two places lost in two corners for Rosberg. Rosberg clearly burning up his tyres there, as he's into the pit lane now. Medium tyres go on the Mercedes, and he rejoins the track in fifth place, not losing a single position there. Team radio to Rosberg: "Right, you are going to the end of the race on this set. 39 laps to go. You need to look after the tyres to get 39 laps out of it." Through the chicane at turn three, Bottas and Räikkönen were side by side, and they somehow managed to get through it unscathed! Bottas and Kimi have to move out the way of Sebastian Vettel who is so far ahead, he's lapping those in 12th and 13th place. The top nine are all on the medium tyres, with Massa in tenth on the supersofts. Räikkönen finally breezes past Bottas, that's 12th position for the Lotus. Replays show Webber trying to move past Van der Garde, who closed the door on the Red Bull and was spun around. The entire end plate of Webber's front wing falls off. The Australian doesn't pit this time, he's going to try and drive it as far as possible in its current state. Incident involving Van der Garde under investigation - ignoring blue flags. Alonso must be aware of the damage to the Red Bull in front of him, but Webber doesn't seem to be too badly affected just yet. Jenson Button is instructed he's getting blue flags for Hamilton. That's going to hurt. 10 second stop/go penalty for Van der Garde - ignoring blue flags and causing a collision. Grosjean told over the radio they are still on track for Plan A, which is presumably one-stopping, as he and Di Resta haven't stopped yet, and are both still in the top ten. Webber runs wide at the hairpin, Alonso closes in again. Alonso sweeps past the Red Bull down the home straight, and he's up to P4. Felipe Massa pits on the supersoft tyres, it will be mediums going on now, as he rejoins in 12th. Vettel has lapped 8th place Grosjean now - how far through the field can he get? Romain Grosjean comes in to the pits for potentially his only stop of the afternoon. It's supersoft tyres on the Lotus. Sergio Pérez comes into the pit lane, he drops down several positions and returns to the track in 12th place, just ahead of teammate Button. Paul di Resta is the only driver not to have stopped yet, he's riding high up in 7th place. On the flip side, Giedo van der Garde has stopped four times so far, one of which was the stop/go penalty. Mark Webber pits from fourth place. Webber is stopped for five seconds which is reasonably slow for the Red Bull crew. Van der Garde has his front wing stuck under the car, dragging it round as he tries to get back to the pit lane. Hülkenberg has stopped on track, so it appears to be a coming together between those two. Fernando Alonso comes in for a quick stop, perhaps anticipating a Safety Car. Van der Garde has pulled off track onto the grass, he's off and out. Replays show Hülkenberg making the pass on Van der Garde, he had blue flags, but they came together with the front right of the Caterham touching the rear of the Sauber. Lewis Hamilton has pitted from second place. Vettel pits from the lead, and it's an incredible stop from the team, three seconds and they send him on his way. Incident involving Hülkenberg and Van der Garde under investigation - causing a collision. Tweet from @OfficialSF1Team: #Hulk touched with VDG which leaded to a puncture. possible more damage on the car. we need to check after race. shame. Webber sets the fastest lap of the race so far, a 1:16.753. Team radio to Paul di Resta: "Paul, so basically, we're going to leave this call to you." They don't want him shouting at them again later. If it's unacceptable, it's his fault. Replays show Vettel running wide off into the grass at turn one, he was briefly overtaken by a Marussia, but quickly got the place back. Felipe Massa heads straight past the Lotus of Romain Grosjean, that's tenth place for the Ferrari, with another Lotus ahead of him. Paul di Resta STILL hasn't stopped yet. Amazing. Grosjean has changed strategy, he's come in for a second pit stop and put the mediums back on. Not a fan of those softer compounds, clearly. Team radio to Webber: "We may catch Hamilton by the end of the race, keep up the pace, keep pushing." 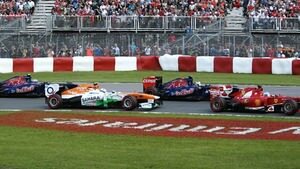 The calm moment of the race, most of the focus is on Alonso as he tries to catch Hamilton in second place. Paul di Resta has pitted!! It's a good pit stop, thank goodness, and he's just got 12 laps to complete on those supersoft tyres. Hamilton gets frustrated with the constant radio calls, "Just let me drive, man" he requests. Rosberg and Vergne have both pitted. The Toro Rosso has been doing pretty well in sixth place. Hamilton has come up on Sutil who is being shown blue flags constantly. The Force India not moving out the way though, and Alonso is still closing in. Finally Sutil gets out the way. Incident involving Adrian Sutil under investigation - ignoring blue flags. And it's a drive through penalty for the Force India. The pair close up on Maldonado, more blue flags are waving. Alonso is so close behind him now. The Williams moves out the way. Maldonado currently running down in 17th, with Bottas in 14th. Not the weekend Williams might have hoped. Alonso pulled alongside towards the hairpin, Hamilton ran him wide to keep the position, but it's DRS next. Through the first corner, it happens, with Alonso up to second. The difference in pace is clear, as Hamilton desperately tries to stay within DRS contact. There's another fight going on between Massa and Räikkönen, with the Ferrari driver hoping for more points. Hamilton has DRS down the first zone, but Alonso keeps the position and slows up to be able to zip away in the second. The battle continues. The one stop strategy has worked out well for Di Resta, he's sitting in seventh place, having improved ten from his start position. Vergne is also doing well in sixth ahead of him. Yellow flags and DRS has been disabled. Esteban Gutiérrez has stopped and the car is in the barriers. The tractor moves in to quickly crane the car away. The lack of DRS is helping out Kimi Räikkönen who is still under pressure from Massa. Double DNF for Sauber, not good. Track is clear and DRS enabled again. Adrian Sutil has still managed to retain a tenth place point for now, despite the drive through. The only cars Vettel has failed to lap so far are his teammate, two Mercedes and Alonso. Everyone from sixth place down has been despatched. Massa sweeps past Räikkönen, moving up to eighth place. Sebastian Vettel wins the Canadian Grand Prix!! This is the first time Red Bull have won in Canada, and it was an absolutely dominant performance. Vettel ecstatic over the radio to the team, very happy with how the car performed. He completes a very slow slow-down lap, waving to the fans all the way round. Vettel jumps out of the car and he's heading straight towards his team to celebrate with them across the barriers. He's quite quickly ushered back to follow the proper procedures. The three aren't talking much in the podium green room. Vettel happily chats with his engineer, Alonso studies the screens and Hamilton looks out the window. They take to the podium, caps off, and the national anthems ring out. Tweet from @alanbaldwinf1: Kimi chalks up record-equalling 24 scoring races in a row, McLaren's run of scoring finishes ends after 64 successive. Hamilton seems a bit happier spraying the champagne, he sprays it directly into Vettel's face... but in a nice way. The three clink bottles, too. A pretty good race, then, not a classic but eventful enough. Clear of Safety Cars and rain, and Vettel was untroubled at the front. We saw some good fights, mostly clean and respectful racing too, with just a bump here and there. Williams missed out on any points, with Bottas dropping 11 places to finish down in 14th. There will be no jumping in the lake this weekend then. Paul di Resta put on an incredible show to one-stop his way to 7th. The team's radio message was pretty telling, but Di Resta can only be happy with climbing ten places in an afternoon. Jean-Éric Vergne also did well to maintain his top ten grid start, he moved up one place to finish sixth, and gains a good points haul from that. Talking of points, Red Bull and Sebastian Vettel are taking a strong hold on the championship. Lotus had a poor weekend as Alonso has jumped Räikkönen and Mercedes have overtaken them in the team standings. We've got another three week gap now, with the next race at Silverstone, for the British Grand Prix. I do hope you'll join me then for Factbyte Factboxing fun. In the meantime, stay tuned to https://sidepodcast.com and http://f1minute.com for all the news and views, and keep smiling!